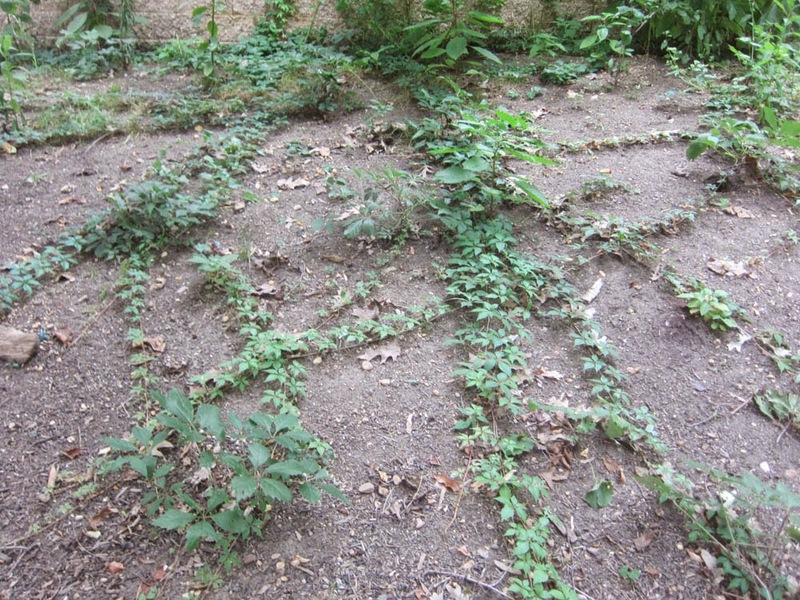 Heroic residents have reclaimed Rosslyn's Hillside Park after it was tragically occupied by invasive English Ivy. New native groundcover, which the Ode Street Tribune's Plants & Mushrooms Bureau has tentatively identified as Chrysogonum virginianum, appears now to be flourishing in Hillside Park. Unfortunately you have misidentified this plant. Chrysogonum virginianum does not have vines as this plant has. Can anyone correctly identify the plant? 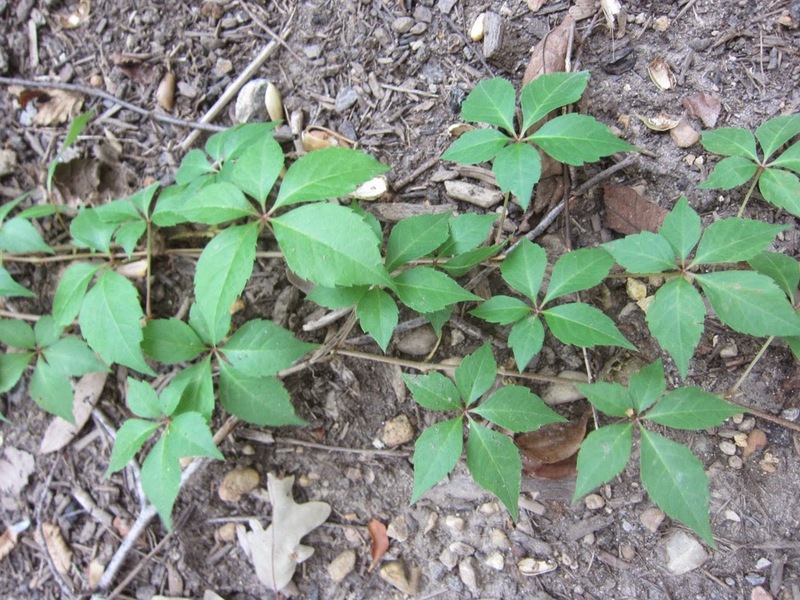 For identification, some closeup photos of the leaves and stems would be very helpful. Is there a central plant in addition to the leaves. Can you provide a poto of the central plant. Is there any indication of flowers or fruit. I've added a closeup. If you click on the photo, you'll see it even larger in a lightbox, at least from a desktop computer. The management of the Ode Street Tribune should consider upgrading the Ode Street Tribune's Plants & Mushrooms Bureau. It appears that not enough resources have been allocated to the Plants & Mushrooms Bureau. Rumor has it that the Tribune's Plants & Mushrooms Bureau has been relegated to a dusty spot in the basement. This is terrible. I suggest that the director of the Tribune's Plants & Mushrooms Bureau should be upgraded to a Vice President rank in order to give the Plants & Mushrooms Bureau more status. Your readers want (and demand) a high quality Plants & Mushrooms Bureau at the Ode Street Tribune. I suggest that the Ode Street Tribune's Plants & Mushrooms Bureau charter should be expanded. This bureau should cover the entire Fungi Kingdom. It make no sense to cover the entire Plant Kingdom and then to only cover one part of the Fungi Kingdom. There are several divisions within the Fungi Kingdom. The Basidiomycota Division includes Mushrooms, Puffballs, Rusts, and Jelly Fungus. By including all Fungi within the charter of the Tribune's Plants & Mushrooms Bureau you will include all Chytridiomycota (chytrids), Zygomycota (bread molds), Ascomycota (yeasts and sac fungi), and the Basidiomycota (club fungi). Possibly you should also include lichens within their charter. Lichens are a symbiotic association between a fungus and an alga and it is difficult to include them with one of the Kingdoms. These are excellent suggestions. Staff assigned to the Plants & Mushrooms Bureau have tended to be dead wood or journalists who just vegetate. Renaming the Bureau to the Plants & Fungi Bureau and upgrading the Chief of the Bureau to a Vice President in the Readers Services Group would signal the Tribune's commitment to plants and all fungi. The future of a habitable earth depends on plants and fungi. Changing the charter of the Bureau to cover plants and fungi is great. However, you have not included lichens. Lichens are not either plants or fungi. They are a symbiotic association between a Fungus and an alga. Lichens are very important for various reasons including that they are an indicator species. Lichens do not grow in polluted air. Please consider expanding the Bureau of Plants and Fungi to include Lichens. I'll recommend to the managing editor that he instruct the Chief of the Plants & Fungi Bureau, who has the status of Vice President in the Readers Services Group, to have his Senior Advisor prepare a strategy review report on changing the Bureau's name to Plants, Fungi & Lichen Bureau. The Tribune is committed to covering all of Rosslyn. Clearly the Ode Street Tribune is moving in a good directions with respect to proper recognition of living thing. However, the title "Pants, Fungi & Lichen" seems a bit strange in that Plants and Fungi are separate Kingdoms in the classification of all organisms. Lichens are not recognized as a formal taxonomic groups because they are polyphyletic. There is also another polyphyletic group, Deuteromycota or Fungi imperfecti, that is not covered by the present title of your bureau. Deuteromycota includes all fungi which have lost the ability to reproduce sexually. In view of the above, I suggest the charter of the bureau be changed to "Plants, Fungi, and Related Organisms". Such a title would have more logic to it and be more inclusive than the present title that includes both organism kingdoms and a polyphyletic group that is not recognized as a formal taxonomic group.